I probably have close to 1000 file folders. All colours. They’re in various places, including a 4-level horizontal filing cabinet, a smaller narrow filing cabinet, drawers in two desks, several Omni carts, several other movable carts with file folder spaces on the top and plastic drawers underneath, and a few file boxes. The files are in many categories. Files with stories and articles that have been published. Files with stories and articles that might never be published. Resource files on a variety of topics. Files on various areas necessary for writers. A file for each book of the Bible. Files for contracts and marketing pages and characters in new books I’m working on…. But that’s not all I have. But never fear. There’s a book for us that I have found very helpful. It’s called Get Organized, Get Published: 50 Ways to Make Time for Success, and it’s by Don Aslett, who has written a number of books about cleaning, and Carol Cartaino. I’ve read it several times. When it first came out, it let me know I wasn’t crazy to want to write 5 or 6 or 20 books at the same time. Later reads taught me other things about how best to organize so that I could work on all those books at one time. I reread it again last fall and it eased the panic I was feeling that I’d never be able to fulfill all my writing goals. One step at a time. 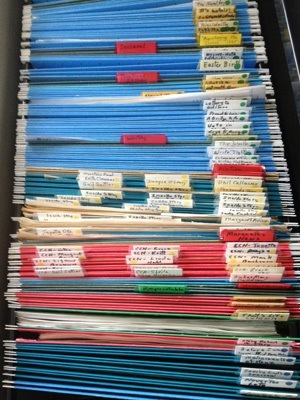 One file at a time…. A file folder holds beginning info, but when you start adding pages cut from magazines or newspapers, books, audio tapes, journals, and other materials, it’s time to get a small plastic bin and label it with the title of the book, so you have a proper place to put things. When you’re ready to stop gathering information—and that might be a few months after you begin or 20 years later—you can go through the materials and then create file folders to start organizing the book. Maybe a folder per chapter, or maybe a folder each for characters, plot, theme, etc. And then a folder for query letters and proposals, and one for marketing ideas, and so forth. 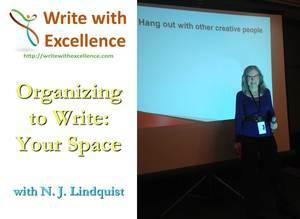 The point is, whether you’re just going to do a little writing—maybe 3 or 4 stories per year—or a lot of writing—say 30 or 40 articles a month or three or four books per year, a little organization will help you get there. Thanks for this information. A good and useful filing system is always a challenge, so I’m looking forward to getting this book.